Milo is a chocolate flavored drinks served locally in mamak stalls offering versions such as "Milo Dinosaur" (a cup of Milo with an extra spoonful of powdered undissolved Milo added to it), "Milo Godzilla" (a cup of Milo with ice cream and/or topped with whipped cream) and "Neslo" (combined with Nescafe powdered coffee). 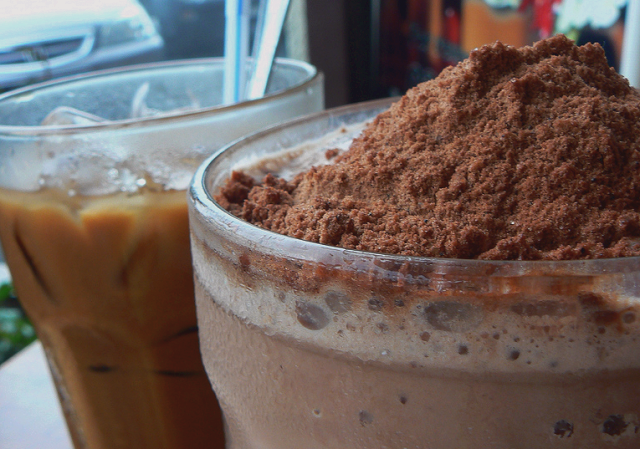 Mix Milo powder with Sweetened Beverage Creamer in a huge glass. Fill in only half hot water into the glass and stir well. Add in crushed ice into glass until full. Add 2 heaped tablespoons of Milo powder. I liked how simple it was. This is pretty good, I sprinkled lots of milo powder and it was delicious!